Does this secret teaser set up a future sequel for the critically acclaimed PS4 exclusive? It's God of War celebration week, in case you hadn't noticed, as developer Sony Santa Monica celebrates the one-year anniversary of its first-class PS4 exclusive. So far, the studio has released a Thank You video to its fans, and a free dynamic theme and several Avatars on the PS4, with more on the way. But hold up a second. That dynamic theme isn't just another way to deck out your console with more God of War fandom, but contains a secret message that could be teasing what's to come for Kratos and Atreus in the unannounced (but definitely in the works) sequel. 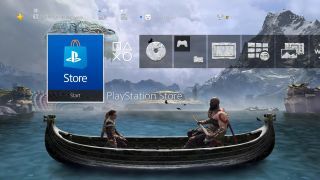 As discovered by eagle-eyed God of War fans on Reddit, a series of Nordic Runes can be spotted etched across the boat that Kratos and Atreus are rowing in the theme. Though they're hard to distinguish at first, zooming in and brightening up the image makes it as clear as day (as seen below), but what do they mean? Well, translate the Runes into rough English, and it says "Ragnarok is coming." Oh boy. If you know your Norse mythology (or, alternatively, have seen Thor: Ragnarok), you'll know that this word holds a great deal of importance in the world of Gods and men, signalling the endtimes that essentially wipes out the entire inhabitants of the Nordic universe. The real question, however, is how long we have to wait for anything more official. The optimists are hoping for Sony Santa Monica to cap off its God of War celebration week with a brief tease of something, anything, but it's unlikely we'll see God of War 2 before the release of the PS5 at the earliest. Think I'm wrong? Let me know in the comments below, and stay tuned to GamesRadar+ for more God of War news as soon as it arrives. Watch the video below to find out 7 things we want from the inevitable God of War sequel, or head over to our list of the best new games of 2019 to see what's on the way.